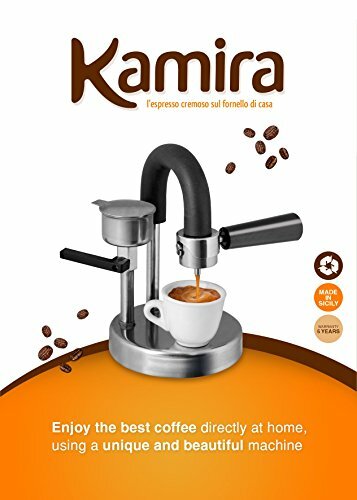 Kamira is the original Italian espresso maker for Italian espresso. Coffee with Kamira is unique: full of flavour, creamy texture and fragrant, it preserves and intensifies the aroma of any blend. Kamira is easy to use: it works on any stove, gas, electric, induction like a traditional moka. Only 30 or 40 seconds to guarantee you a perfect espresso, strong or mild according to your own taste. The amber-colored rich cream makes a strong coffee, keeping intact all the aroma and making each cup of coffee a moment of great pleasure. Kamira is organic and reasonably priced: • its secret is a special patented device not subject to use; • the espresso maker is long lasting and recyclable; • it has stainless steel finish (no electronic parts); • it is cost effective and environmentally friendly because it does not use expensive coffee pods - instead you can buy any blend of ground coffee you prefer; • it costs less than electric espresso makers; • it is the only espresso maker that offers you a five year warranty. Kamira works on any source of heat also induction ; so you can take it anywhere - perfect for traveling or camping. The experts are always at your disposal to give you help and advice! HAND CRAFT MADE IN ITALY! it has stainless steel finish (no electronic parts, it is the only espresso maker that offers you a five year warranty. If you have any questions about this product by KAMIRA, contact us by completing and submitting the form below. If you are looking for a specif part number, please include it with your message.